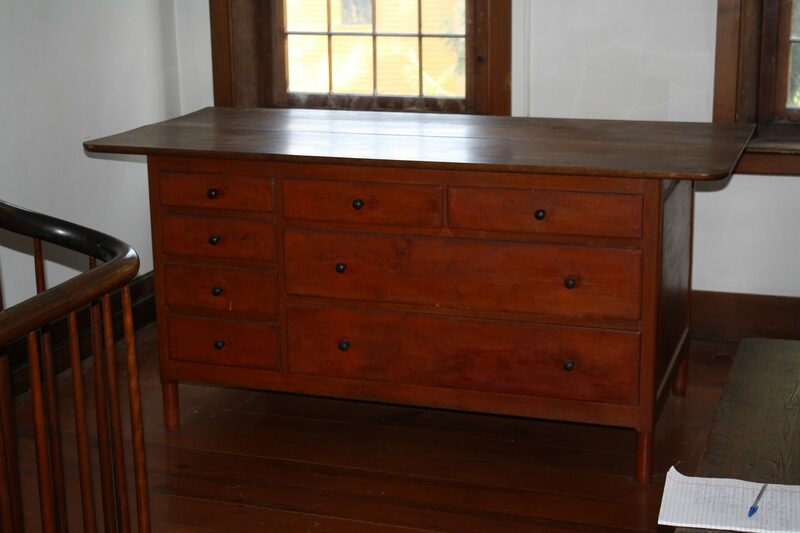 Shaker craftsmen used traditional American Furniture forms and adjusted those forms to suit their needs and aesthetics. Their simplicity of line, limited ornamentation, and conservation of space all served to make their furniture distinctive and created a design sensibility that continues to be duplicated even today. The Shakers employed a continuity of design which united all the Shaker communities, whether they were in Maine or Kentucky. However, each community took the standard design and changed it just slightly in order to make it specific to their particular village. 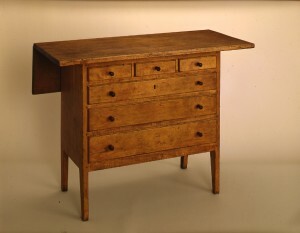 The Shaker craftsmen at Hancock used unique design elements such as tapered drawer sides that help to differentiate furniture from the Hancock “bishopric” which included villages at Tyringham, Massachusetts and Enfield, Connecticut. 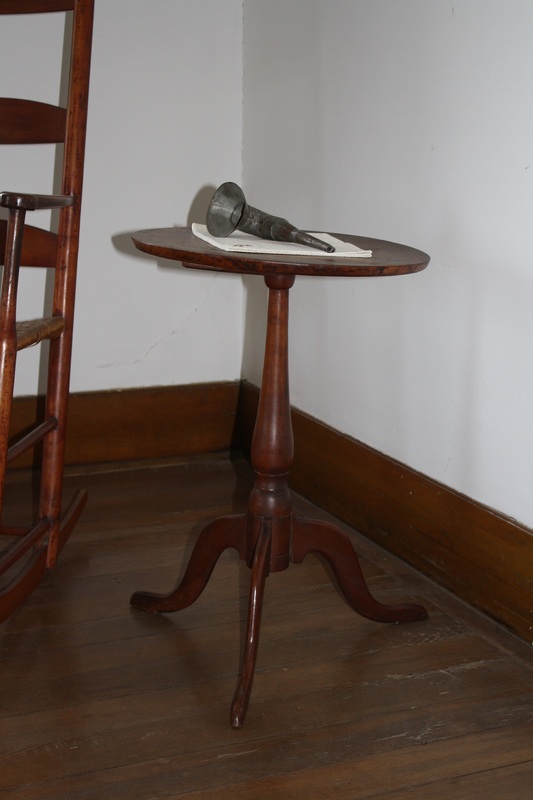 The Shakers were master carpenters and found new ways to utilize their spaces in order to make them more efficient and clean. 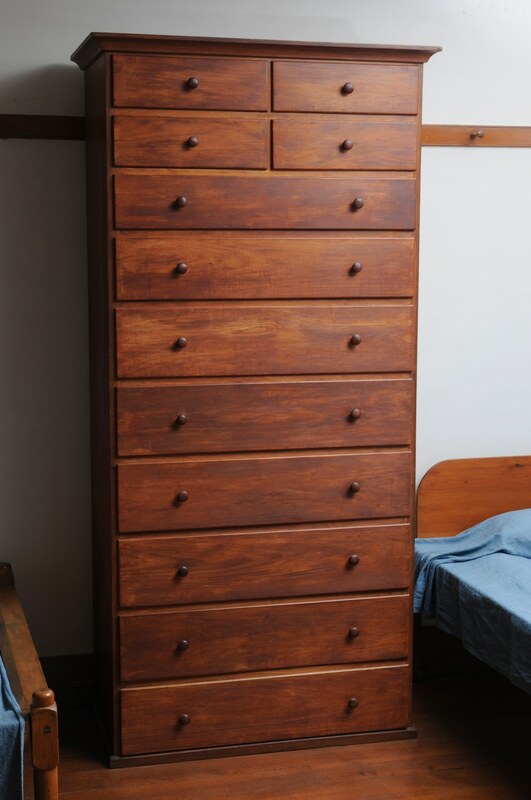 These traits come together to create the built-in units of cupboards and drawers that epitomize Shaker buildings today. 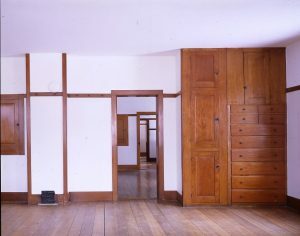 In the Brick Dwelling at Hancock, these built-ins have a distinctive joinery technique that is unique to the communities at Hancock, Tyringham and Enfield, Connecticut. 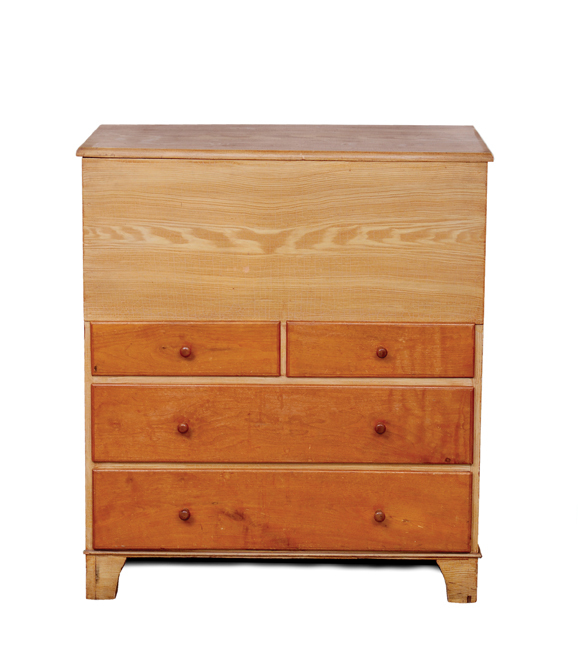 They feature dovetailed drawers with tapering drawer sides. 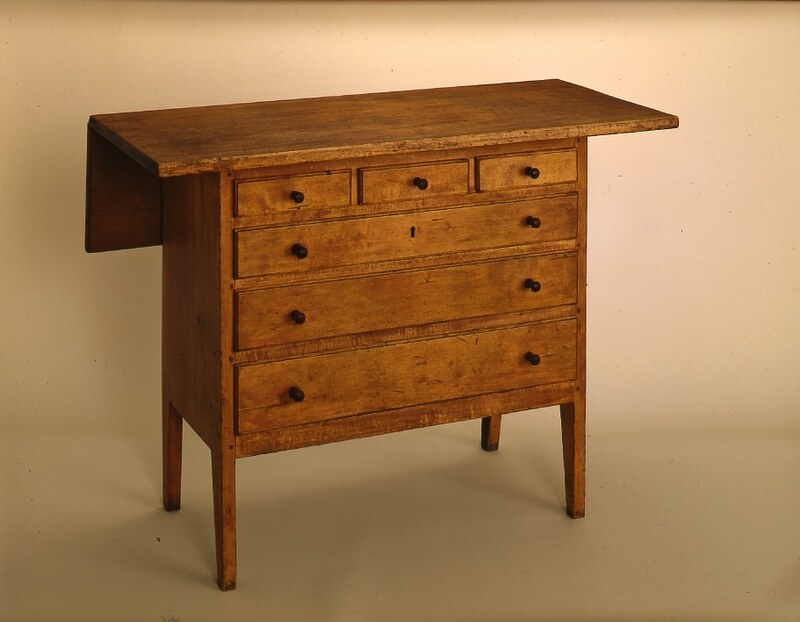 Why the Shakers built their drawers in this fashion is unknown, and the fact has mystified many woodworkers in the decades since their creation. 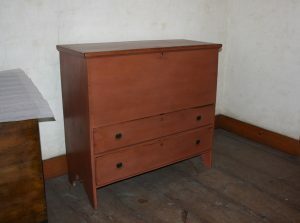 This Case of Drawers were made by Elder Grove [Wright] and Brother Thomas [Damon] and placed here thursday, January 13th, 1853. It was the day our Ministry expected to return to the City of Peace [Hancock], but were detained on account of the snow storm which occurred on that day. This blanket chest is attributed to Elder Grove Wright and features some distinctive Hancock furniture traits. It incorporates tapered drawer sides as well as the use of butternut for the drawer fronts. The unique grain-painted finish is not found on many Shaker pieces, and was most likely a later Shaker addition as tastes began to change and move into the highly decorated Victorian era. This diminutive sewing case is illustrative of a large number of sewing cases that can be attributed to the Hancock community. The smaller size could accommodate seated sisters and their work, and the shallow drawers were ideal for holding small sewing implements. The rear drop leaf with a wooden support allowed the user to expand the cutting surface. The construction of this case is different from most in that the sides are made out of a single piece of wood and the legs were created out of the cutout. 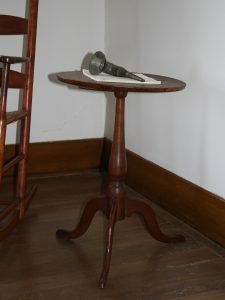 This type of stand, sometimes called a “candle stand” was so-called because it had just enough room to place a candle and a book on its top. A popular form in the nineteenth century, the Shakers created streamlined versions of this stand and each village made them slightly differently. At Hancock, the legs were tenoned rather than dovetailed into the base, and the shafts exhibit a swelled form ending in a small ring. 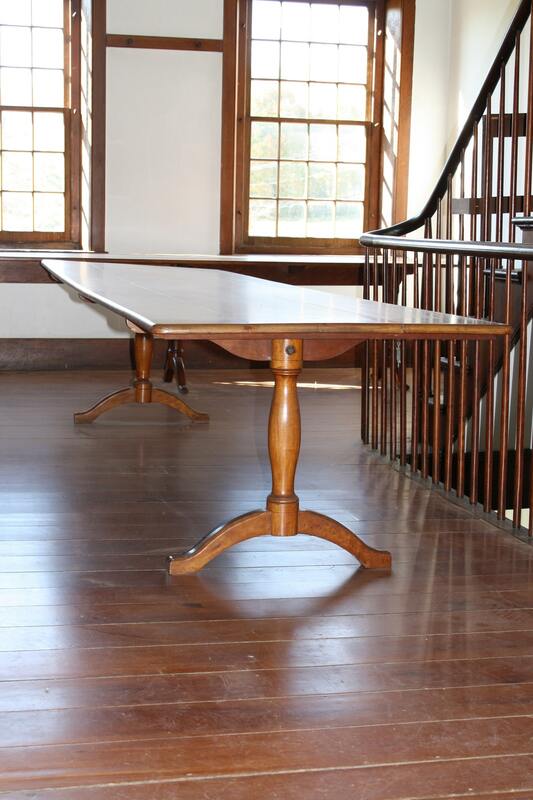 Trestle tables like this one are indicative of the Shaker family and their emphasis on communalism. Men and women ate separately and silently at tables like these in the large dining rooms in dwelling houses. This table is attributed to a Hancock craftsman based on its turned legs. In an undated photograph of the East Family dining room, two tables are set for a meal and the elements of comparison are clear: the tables in the photo exhibit the same support brackets, turned legs and arched feet as the table in the museum’s collection. This is a work counter and exhibits the typical tapered drawer side construction of most Hancock furniture. 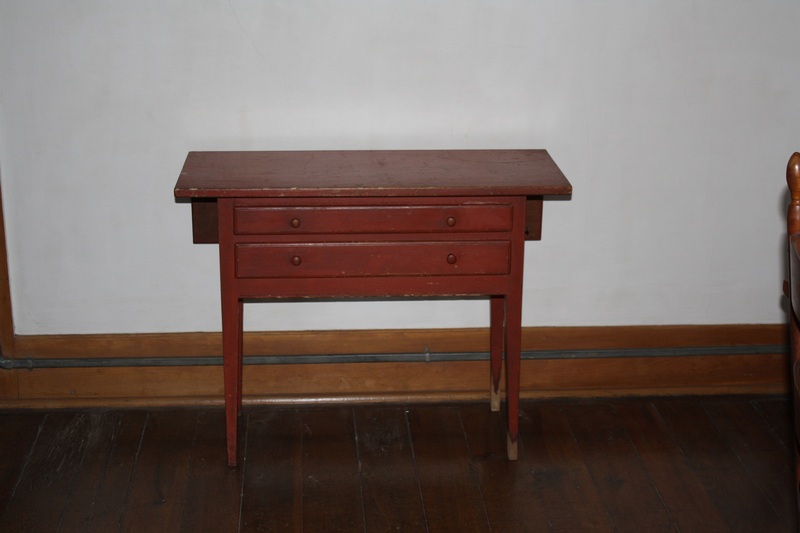 The raised side panels, red paint and drawer arrangement is different from later counters and dates this piece to the early 19th century. The legs are also consistent with other Hancock forms: square legs become cylinders and taper to the floor. The highly adaptable double drop-leaf table was favored by the Shakers. 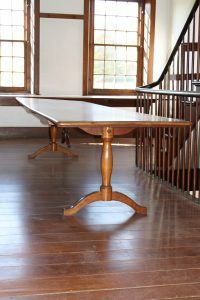 They made these tables to be light so they could be moved easily, and the double drop-leaf design allowed for multiple uses. 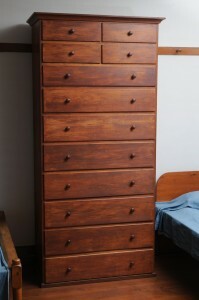 As was typical, a drawer for storage was added on one or both ends. Hancock tables are identified as having a square leg which transitions seamlessly into a turned tapering leg. 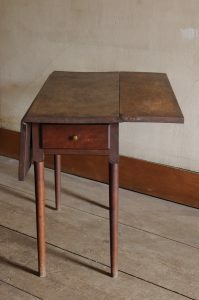 This small sewing table is stained red and has the familiar rear drop-leaf that sisters would use to expand their work surface for cutting fabric. 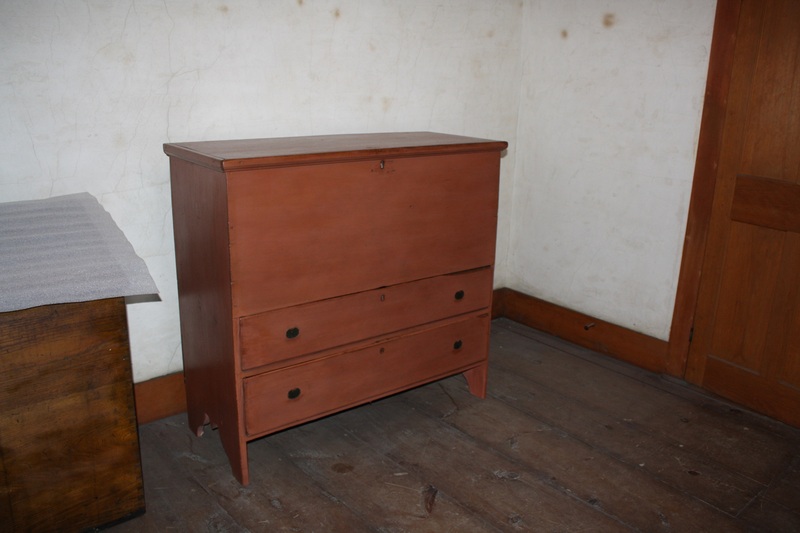 Two small drawers are shallow and ideal for holding sewing implements. The legs are unique in that they are square for two inches below the bottom rail before tapering towards the floor. The two brass knobs on the left side of the case may have been later additions that would have held small sewing tools or a fabric workbag (as noted by scholar Tim Rieman). 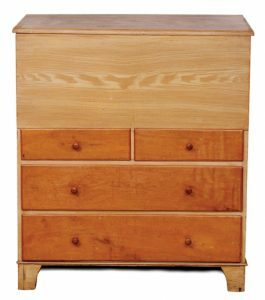 This two-drawer blanket chest provides an early example of a case piece with tapered drawer sides. 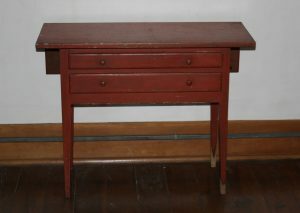 It is considered early because of its decorative feet, wire hinges and large drawer dovetails. 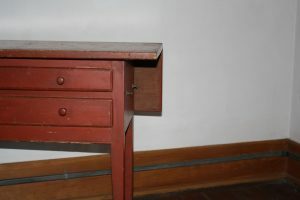 The red paint may have been added later, and its hardware is missing so it does not appear to have the classic and elegant Shaker form associated with later pieces. 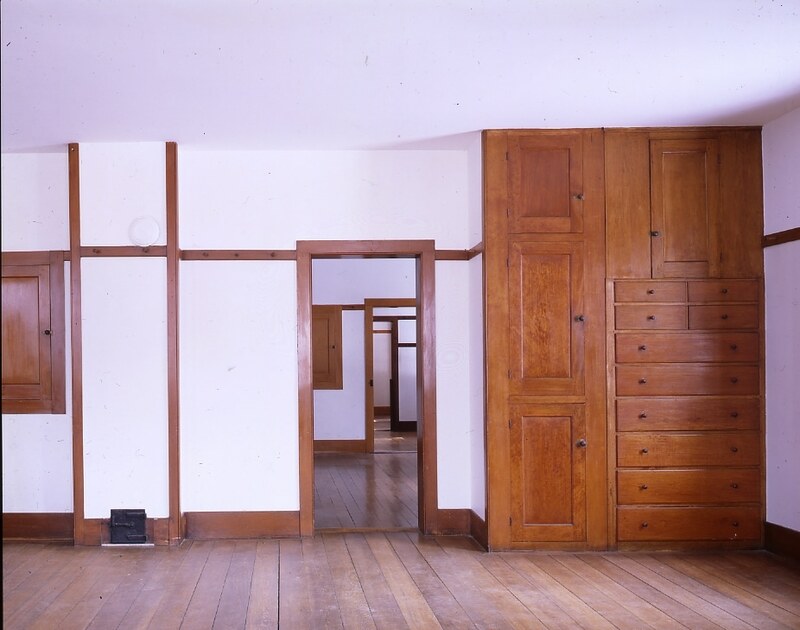 However, it does serve a scholarly purpose and helps furniture historians to make connections about construction details and trends at Hancock.